It's funny how intimidating it can be to try to reenter a space you've left for a while. 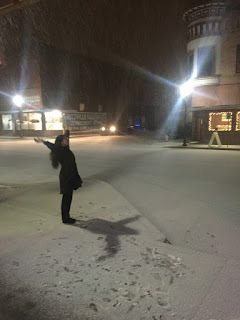 My blog was once the coziest, safest room I could find in which to put my feet and think things over by writing them out and sending them into the Internet tubes (and to a few lovely friends!). Now it feels alien in a way I could never have anticipated. But then graduate school happened, and my quiet, introspective bubble expanded. My program centers case studies, group work, and intense personal and interpersonal reflection. We spend a ton of time talking about our work and how we can do it more effectively or equitably. This is both hella stressful and the most fulfilling way I've ever worked with others. I've forged a lot of strong bonds in that crucible of team work and trial and error. I never expected such an interpersonal program to work well for non-confrontational me, but, hey, personal growth, right? I'm leaving this program* with a better idea of what I value, personally and professionally. I'm still trying to figure out where a book blog (or any kind of blog) fits into this new understanding of myself. Since I last posted here fourteen months ago, I've read a total of 26 books, a bit fewer than two a month. I still read, but it's slower. I savor picking up a book for fifteen minutes a day when I can, or squeezing audio in while I do the dishes. I did not expect it, but I'm enjoying that pace. I'm a distractible person, and I find books blur together when I try to read them back-to-back. I take more time now to embody the author's universe, more time to mull the characters and the big ideas over. Oh, and it has to be fiction, fiction-based, or told like a story. Ain't nobody got time for hard nonfiction in grad school. My favorite books from the past year and change have been Born a Crime by Trevor Noah, Rebecca by Daphne du Maurier, The Gate to Women's Country by Sheri S. Tepper, and Lilith's Brood, the Xenogenesis trilogy by Octavia E. Butler. Two audiobooks, two paperbacks, all standouts during a time when nonessential content fell by the wayside. Part of me thinks they mean more, somehow, but it could also be they came to me at the right moments. I'd recommend any of them if you want to get swallowed up by a story or let a narrator whisk you off. Everyone and their mother knows Noah narrates his own audio and how excellent it is. Rebecca's narrator was just aces at bringing the spooky factor to the story). Right now, I'm making my way through One Hundred Years of Solitude by Gabriel García Márquez. I put it down for a month or so, but the benefit of Márquez's meandering magical realism is not losing any plot threads. I plan to tinker around a little more here and see if the mojo returns. I can't say how it will turn out, but I'll feel better knowing I didn't let this space perish from sheer inertia. *Did I mention I finish school in three months? What the hell. When did that happen?! A blurry photo of me, ostensibly doing field work in eastern Washington but mostly enjoying snow. Wow, hey, hello! A blog post. I've sort of forgotten what to do with this big, blank text box, so you'll have to bear with me for bit. Welp, the thing happened. I officially went blog silent. I knew graduate school would be a huge investment of time, tears, and brain cells, but I had the tiniest sliver of hope that I would keep up at least a trickle of reading and posting. Men We Reaped for Social Justice Book Club? The most wishful of thinking. All of the books I packed up and shipped across the country? Graciously keeping track of all of the dust in my apartment. My graduate program gobbled me up in September and, with yesterday's submission of a 60-page report, only just spat me back out. Now I'm sitting here, a little bit dazed and rumpled, wondering what the heck to do with myself now. Because, guys, so much has happened. 1. I have learned so. much. I have more than 200 pages of Microsoft Word documents, including two real, actual, useful projects for local and state health organizations, to show for it. 2. I have started making friends. The way my program is set up makes this just about inevitable (you can't spend 6+ hours per week with seven other people without getting to know each other), but y'all know how hard this is for me. I can say without reservation that I am going to carry some of these people with me for the rest of my life, and I feel so lucky to have them. 3. Trump got elected. I spent a couple of weeks deep inside my own head, trying to figure out what I personally could do to make the world better, even in the smallest of ways, especially for my friends and peers of color. I succeeded sometimes and I failed at others, but I tried. I am going to keep trying. 4. On that note, I feel more certain than ever that I am on the right path, personally and professionally. I went into this quarter determined to be open, to learn, and to get the work done. I'm leaving it with more confidence than I have ever had that I can handle all of the stuff this life thing wants to throw at me and that I can handle much of it in way less time than I ever thought possible. I am amazed by what trust in myself, my colleagues, and my loved ones has produced in the past three months. All right, anything else? Oh, BOOKS. I have read a grand total of *drum roll* FOUR books since school started. All right. I'm off to drink tea and do laundry, because apparently that's what the first day of winter break is for. And how are YOU? Please tell me, because I have not been reading your blogs. I'm so excited that I'm finally going to participate in the Social Justice Book Club, hosted by the lovely Kerry of Entomology of a Bookworm. I've wanted to participate since the club got started back in April, but the stars simply never aligned (read: laziness, moving, more laziness). 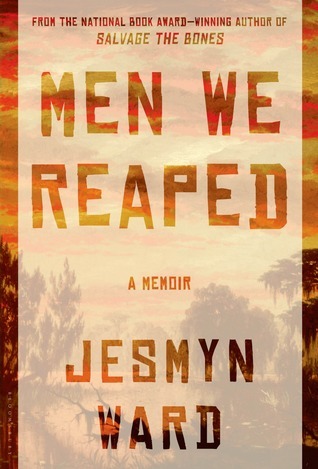 Men We Reaped: A Memoir by Jesmyn Ward will be the last book club selection before the new year, so I finally decided to hop on the bandwagon. May graduate school forgive me. To start, Kerry put together some introductory questions for us clubbers. Given my current sporadic blogging schedule, I'll most likely be sharing hot takes on Twitter (@shainareads) under the #SJBC tag. It's also possible some content may show up on Instagram (@shainareadsbooks), Litsy (@shainareads) and Snapchat (@shainareads), but I'm very much crap at checking anything but Twitter these days. We shall see! Also, Janani and I may host an #SJBC Twitter chat! This will soon be determined. For the very first time, I can answer this question with something other than Connecticut! I recently moved to Seattle, Washington for graduate school and, barring anything unexpected, I'll be reading here for the whole month. My local address, however, will change in October; my boyfriend and I get the keys to our new apartment tomorrow! Like I said above, I have not yet successfully joined in on a Social Justice Book Club read. Given how excited I was when Kerry first floated the idea for the club, I'm moderately ashamed it's taken me this long to participate. I also happened to have Men We Reaped already loaded up on my Kindle, so it was meant to be. From what I've heard about Men We Reaped, I fully expect it to sock me in the gut, let me get back up and then roundhouse kick me right back to the ground. I've been drawn to books like this for as long as I can remember, but I think it will be an especially timely read considering my current graduate school classes. Right now, we're immersed in learning about how the American (public) health system (and American society on the whole, really) only sets some of us up for success. The men Ward writes about here were not among those privileged few, and I don't expect her to mince words as she explains why. Are you participating in the Social Justice Book Club this month? Have you ever participated?